How Much Can You Make in a Biology Career? What Courses Can be Taken for an Online Biology Degree? Studying biology — the science of living organisms — provides students with a comprehensive understanding of life, natural sciences, and biological processes. Due to extensive coursework across diverse subject areas, the degree gives students the flexibility to pursue many advanced career paths in the sciences. According to the Bureau of Labor Statistics (BLS), zoologists and wildlife biologists earn a median salary of $62,290; microbiologists average $69,960. Students who leverage their bachelor’s in biology towards a healthcare occupation can go on to a career with a projected job growth of 18% by 2026. This growth makes now a great time to pursue a degree that offers so many lucrative and stable career opportunities. 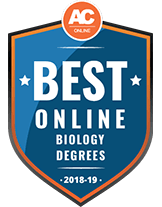 This guide covers everything students need to know about earning an online biology degree, from curriculum and concentration offerings to potential jobs and their associated salaries. We also discuss financial aid and available scholarships to fund an online biology degree. For our ranking of the best online bachelor’s degrees in biology, we culled data from IPEDs concerning each school’s graduation rates, online course availability, total tuition cost, and other determinants of student success. While many factors go into making an excellent bachelor’s program, these characteristics contribute significantly to both student experience and student outcomes. Read on to see the school profiles for each of the top-ranked programs on our list. The Bachelor of Arts in Biology degree at the University of Florida prepares students for careers in fields such as bioinformatics, pharmaceutical research and food safety. Students explore major topics in organismal biology, ecology and evolution and diversity. UF requires all online students to complete an original capstone project. In total, distance learners must complete 120 credits of online classes with a "C" or higher. Online students typically complete this degree in 8 semesters. Online students at Davenport University can earn a Bachelor of Science in Biological Laboratory Science in 4 years or less. This 120-credit curriculum can serve as a degree completion program for those who already hold an associate degree. Online learners at DU explore cell and molecular biology, forensic science and additional topics in genetics and biology. Upon completion of the program students are prepared to work in lab settings as technicians or research associates. Applicants should submit their high school transcripts and SAT or ACT scores. Upon admission, incoming students must take an entrance exam to help DU place them in the appropriate general education courses. Distance learners at Logan University can earn a Bachelor of Science in Human Biology. Students need 122 credits for graduation which span degree-related topics in mathematics, Communications, Behavioral Sciences, humanities and physical sciences. Upper division major courses include organic chemistry, physics, microbiology and biostatistics. Online classes are delivered over the course of 3 15-week trimesters. Prospective students must have a 2.0 high school GPA or higher and submit their ACT or SAT scores. Regular tuition for online students is $275 per credit hour. Students with a 3.5 GPA or higher receive a merit-based tuition rate at $150 per credit hour. The University of Maryland University College offers a 120-credit Bachelor of Science in Biotechnology. In this program, online students learn ethical standards of practice and modern approaches to conducting academic research or developing products and services. Major-specific courses in this curriculum include molecular and cellular biology, bioinformatics and lab safety. In-state and out-of-state students pay $294 and $499 per credit, respectively. Graduates of this program typically go on to pursue careers in biomedical research industries, agricultural studies, lab technology development and bioinformatics. As biology studies life and living organisms, the broad umbrella of its subject matter opens the door to many possible career opportunities that are projected to grow at a steady pace until 2026. Biology students can go on to gain employment as biologists or microbiologists. They may also pursue work in health occupations, environmental science, agriculture, or research, all of which require a solid foundation in natural science. The following table outlines common careers that graduates of an online biology degree may pursue, including salary potential and job growth projections. Keep in mind that earning this bachelor’s degree does not necessarily make you eligible for these roles. Zoologists and wildlife biologists use the knowledge gleaned from their degree to study animals and their ecosystems. A typical day may require studying animal behavior or examining how humans are affecting a specific animal population’s livelihood. Depending on their area of focus, zoologists may work in the field or in research centers. Microbiologists specialize in researching microorganisms like bacteria, viruses, and fungi. They focus on how these microorganisms live, grow, and prosper. A microbiologist may spend their week classifying newly discovered microorganisms or analyzing new drug therapies to see how they combat infectious agents. Microbiologists perform ample laboratory research and physical experiments on their subjects. Biological technicians work alongside biological and medical researchers and scientists to assist in laboratory experiments. They set up and calibrate equipment, gather biological samples, conduct experiments, and analyze the results. Their research can cover many areas, such as experimenting with new medical treatments, assisting zoologists with sample collection in the field, or focusing on microorganisms while working under a microbiologist. Conservation scientists, also called foresters, promote the protection of land. They often work on forests, parks, and rangelands to monitor their upkeep and quality. On a given day, a conservation scientist may focus on overseeing conservation activities to ensure habitat protection, select lands to be modified with new planting or management efforts, or develop new strategies for forest preservation while abiding by government regulations. Environmental scientists specialize in the natural sciences and work to protect both the environment and human health. These specialists may focus on pollution reduction efforts or perform assessments to determine the potential environmental and health risks that could be generated from new construction. They prepare detailed, evidence-based reports to present their research and effect positive change. Browse the following list to see a breakdown of state-specific data on the average salaries and job growth for zoologists and wildlife biologists. These numbers can vary by state for a number of reasons, including the average cost of living, the typical experience level of other competing professionals, the differences in demand for that role, and the employer. Washington and California currently employ the highest number of zoologists and wildlife biologists, though states on the east coast often pay their zoologists higher salaries. Earning a bachelor’s degree in biology requires comprehensive coursework in the natural sciences. Learners typically take both theory and laboratory courses to best develop their scientific competency and problem-solving skills. Students can also take elective courses that interest them. Read on for a list of five courses commonly offered in biology bachelor’s degrees online. As each school varies in their offerings, though, learners should check the school’s course catalogue for more information on specific course offerings and core requirements. This class introduces biology as a natural science and covers the structure and function of life from molecules to organisms. One major focus of general biology is cellular organization and how cells shape different life forms. The study of evolution looks at how biological populations change over time through different generations. The class examines adaptation, gene expression, natural selection, and cellular mutation. Students taking organic chemistry study the fundamentals of carbon compounds, from basic bonding to molecular interactions. Learners analyze the structure of organic compounds and learn to name and classify ions and molecules. Microbiology explores the structure and function of microorganisms. Through laboratory work and research, students analyze microbes and how they grow, reproduce, and cause human disease. Learners taking human physiology delve into the structure and function of the body’s tissues and organs. Coursework covers human body systems and how they interact as well as internal mechanisms that maintain bodily health. Students should consider multiple variables when deciding which online bachelor’s degree in biology program is right for them. Important factors include tuition cost, prerequisites, program requirements, and graduation and retention rates. Learners should also choose a program that offers the degree and concentration they want to pursue. Moreover, each school’s accreditation status and reputation plays a major role in career outcomes. The next section answers some of the most commonly asked questions about pursuing an online biology degree. What type of accreditation should I look for when selecting an online bachelor’s degree in biology program? Two types of school accreditation exist: regional and national. Regional accreditation, as awarded by the Northwest Accreditation Commission, is the most widely recognized. National accreditation focuses on technical and vocational schools. National accrediting agencies include the the Distance Education and Training Council. In some cases, programmatic accrediting agencies like the American Institute of Biological Sciences may also endorse specific programs. What strategies should I follow in choosing my biology courses? Students earning their online biology degree generally take a combination of core and elective courses. Review your school’s course catalogue to determine which classes you are required to take and then choose the elective courses that fascinate you and are applicable to your major. If you want to pursue a program concentration or follow a particular career path, select coursework that applies to your future goals. What other types of classes will I be expected to take? Most schools offering a bachelor’s degree in biology require their students to gear the majority of their classes towards their major and take a certain number of credits in other areas. This ensures that learners study both humanities and sciences. Depending on the school, biology students may also take courses in English, mathematics, art, psychology, anthropology, or history. How is an online program different from an on-campus one? Online learning provides a great option for working professionals. Unlike on-campus students who attend scheduled courses with a close cohort of students, distance learners can work asynchronously. They do not need to commute to campus and can complete their work from anywhere with an internet connection. The degree outcomes for both online and on-campus programs are the same, and both types of program are equally intensive. How long does it take to earn my biology degree online? 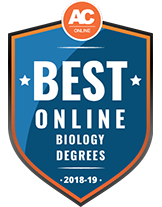 Most students can complete the 120 credits of coursework required for the average online bachelor’s degree in biology in four years. As online learning typically offers more flexibility than brick and mortar institutions, students may choose to attend part time and work at their own pace; part-time learners typically graduate in six years. Other programs offering asynchronous coursework may allow students to work at an accelerated pace and graduate more quickly. While undertaking higher education presents a significant expense, a variety of options exist to offset the cost. Fill out a Free Application for Federal Student Aid (FAFSA) form to check your eligibility for federal funding. Personal loans may also help, but keep in mind that both federal and personal loans need to be repaid. Scholarships are particularly favorable as recipients do not need to pay the money back. Read on to learn more about five of the many available scholarships tailored to students earning their degree in biology. This undergraduate scholarship provides two years of funding to rising juniors studying in the science, technology, engineering, and mathematics (STEM) fields. Their studies need to support the National Oceanic and Atmospheric Administration’s (NOAA) mission to be applicable. Students also need to be enrolled full time at an accredited minority-serving institution, maintain a GPA of at least 3.2, and spend two summers interning at NOAA institutions to receive the $45,000 in funding. Open to juniors and seniors studying a topic relevant to a future career in health sciences, Gallagher Student offers six scholarships of $7,500 to learners demonstrating academic excellence and financial need. Applicants must currently be attending a four-year accredited institution. To apply, students need to submit an essay detailing their future health-related career goals as well as two letters of recommendation, transcripts, and a financial aid form. National Garden Clubs, Inc. awards $4,000 to up to 41 undergraduate and graduate students per year. The scholarship is available to juniors and seniors at accredited undergraduate institutions who currently study a field related to horticulture or the environment. Preference is given to students studying plant biology who maintain a minimum GPA of 3.2. Applicants also need to be planning a career in horticulture, environmental science and preservation, or botany. The Rocky Mountain Elk Foundation (RMEF) offers Wildlife Leadership Awards to outstanding college students studying natural sciences and interested in wildlife science. The $3,000 scholarship and one-year RMEF membership goes to applicants who demonstrate leadership abilities, a commitment to wildlife preservation, and a dedication to environmental conservation. Many scholarship recipients go on to pursue careers in wildlife management and several have found employment through RMEF itself. Offered through the United States Department of Agriculture (USDA), this award is tailored for learners studying biological sciences who want to pursue a career in protecting the U.S. agriculture and environment. Interns receive up to $5,000 annually in tuition assistance, mentorship opportunities, and potential paid work experience through the USDA. Applicants must be a sophomore or junior at an accredited school and possess a minimum GPA of 2.5 to apply for the program.